There is more than one type of minor scale. There is natural minor, harmonic minor, melodic minor, Dorian minor, Phrygian minor and more. General speaking, the plain, or “natural,” minor scale is the sixth mode of the major scale, Aeolian. Just as the first mode of the major scale, Ionian, is simply referred to as the “major scale” (even though there are two more major modes), the sixth mode is usually referred to as simply the “minor scale” (even though there are more minor modes). For this reason, the first and sixth modes are called “relative” major and minor. 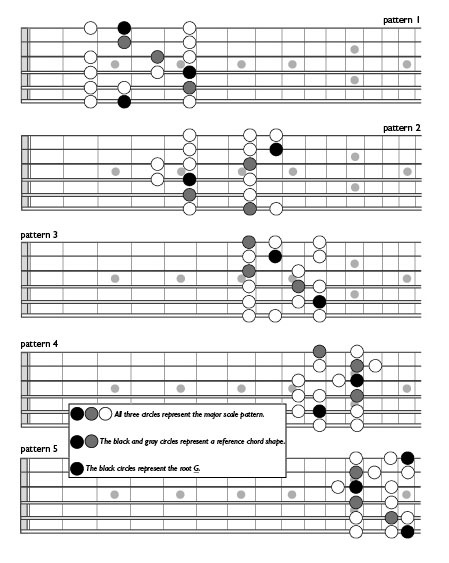 Attached is an image illustrating guitar fretboard patterns for the G major scale. G’s relative minor is E. You don’t need to learn new patterns to change from G major to E minor. You don’t need to move patterns either because the notes of G major are exactly the same as the notes of E minor. If you play the notes and patterns over a G major chord, or a progression that is tonally centered on a G major chord, then your ear will hear G as the center of the scale too, producing a G major tonality. If you play the notes and patterns over an E minor chord, or a progression that is tonally centered on an E minor chord, then your ear will hear E as the center of the scale, producing an E minor tonality. An example of a song centering on G is “Wonderful Tonight” by Eric Clapton. An example of a song centering on E minor is “Paranoid” by Black Sabbath. You can actually use the exact same notes and patterns on both songs. Try it! This is assuming that you’re using chords from the G major/E minor scale (I ii iii IV V vi). G major and E minor are present in other keys too. If you play something tonally centered on one of these chords but in another key, then you need to use major scale notes and patterns that correspond to that key. To learn more about this, see Fretboard Theory Chapter 8: Modes. There are many different types of minor scales that can be constructed. The most common are Aeolian mode (natural minor), Dorian mode and harmonic minor, in that order. The rest are used very little, if at all, in popular music. Understanding and applying scales correctly requires that you learn about major scale patterns, chord progressions, playing by numbers and modes. All of these topics are taught in my guitar theory books and DVDs. Click the link to sign up for a free preview. After listening to a Desi’s free podcast (3. 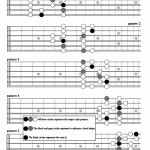 How to Learn and Practice Guitar Pentatonic Scale Patterns and Songs) where he suggested that they are all conjoined dawned on me to to use layers in a vector program to display the patterns, positions and notes on the fretboard. Sure enough – there are no empty spaces – it’s the big picture … at last. Using a draw program with layers allows you to grab a position and slide it up and down the necks as a way to visualise and memorise.